FILE - Chinese President Xi Jinping, center, attends the opening of the 19th National Congress of the Communist Party of China at the Great Hall of the People in Beijing, China, Oct. 18, 2017. A top official in China has praised President Xi Jinping's expansive anti-corruption drive, arguing it has helped stop coup plotters from threatening the party's tight grip on power. Chinese officials have previously talked about the threat that "plotters," "cliques" and "conspirators" pose to the party, but the remarks from Liu Shiyu, chairman of the China Securities Regulatory Commission, were the clearest to date. However, analysts say that while the revelation is stirring much speculation, and much remains unclear, the linking of key political figures past and present sends a clear political message that seeks to justify Xi's increasing power and expanding national security regime. FILE - Liu Shiyu, chairman of the China Securities Regulatory Commission, attends a discussion group meeting held on the sidelines of China's 19th Party Congress at the Great Hall of the People in Beijing, Oct. 19, 2017. Speaking Thursday at a meeting on the sidelines of China's 19th Party Congress — a twice-a-decade event and leadership reshuffle — Liu said Xi's anti-corruption drive has "cleared up huge risks for the party and the country." In his remarks, he listed six important former political figures and alleged coup plotters: former rising political star and Chongqing Party Chief Bo Xilai; security chief Zhou Yongkang; Ling Jihua; two former People's Liberation Army generals, Xu Caihou and Guo Boxiong; and Sun Zhengcai. "They had high positions and great power in the party, but they were hugely corrupt, and plotted to usurp the party's leadership and seize state power," Liu said, calling the cases and their actions "shocking." Bo, Zhou, Ling and Guo have been sentenced to life in prison on corruption charges; Xu died before he was charged. Sun was removed from his post as Chongqing's party secretary in July. Until then, he was a key contender for a spot on the party's powerful Politburo Standing Committee, which will be selected next week. It is a body that analysts say Xi is looking to fill with his allies to further cement his position as China's most powerful leader in decades. FILE - Sun Zhengcai, party secretary of Chongqing attends a meeting on the side line of the National People's Congress in Beijing, China, March 6, 2017. Liu did not provide any details about how the individuals may have plotted or worked together. Most of those named were part of a handful of high-ranking officials toppled in recent years, but his naming of Sun was a first, and it was surprising given that few details of his case have been released to the public. Sun has been accused of "grave violations of discipline" a vague phrase that could refer to both corruption and disloyalty to the party. Late last month, state media announced that his case has been handed over to judicial authorities and that he was expelled from the party. The allegation and naming of Sun, along with other plotters, left some analysts scratching their heads. 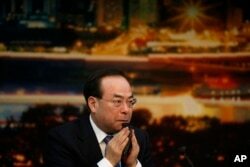 David Kelly, research director at the Beijing-based China Policy, said the allegations send a clear political message. "Xi has faced massive systemic corruption from day one, and his tools are basically shock and awe, and this is another instance of it," Kelly said. Hong Kong-based China watcher Willy Lam said he found the naming of Sun quite "strange" and "astounding" because while Bo, Zhou and others were clearly part of an anti-Xi Jinping clique within the party, how Sun fits into that picture — if at all — is less certain. 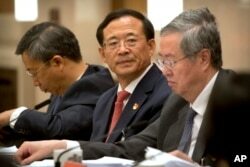 The allegations do help justify Xi Jinping's consolidation of power, said Lam. FILE - Chinese President Xi Jinping delivers a speech during the opening session of China's 19th Party Congress at the Great Hall of the People in Beijing, Oct. 18, 2017. "He [Xi] is saying that despite the success of the anti-corruption campaign and despite the smashing up of these conspiratorial cartels and cliques, there is no guarantee that these conspiracies will stop," Lam said. "This helps him justify concentrating all of the power to himself." During his address at the opening session of the Party Congress, Xi made it clear that corruption is the party's "biggest threat." It's a threat that he said is not going away any time soon. In his speech, Xi also talked about the creation of a new Leading Small Group for Governance by Law and the creation of a National Supervision Commission, which will consolidate a range of supervisory organs, including China's powerful Central Commission for Discipline Inspection — which has been leading the charge in the anti-corruption drive. 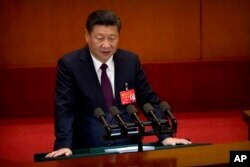 Xi also announced that a new National Supervision Law would be introduced early next year to regulate the commission. China Policy's Kelly said that leaving aside factional issues and personal ties, which are all possible, the allegations do strengthen the position of Xi's new national security regime. "This event and this interpretation of the event as a national security event, legitimizes this new bureaucracy," Kelly said. "It underscores the threat within the party itself."